1 ea. Model 1011PUB Pub Table: 20" diameter x 40" high. 2 ea. 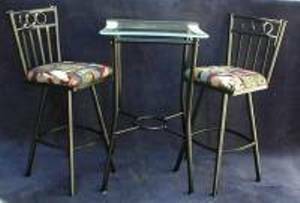 Model 505-30S Swivel Stools: 30" seat height. $684.88 shipped anywhere in the 48 contiguous states. Includes the a 1/2" x 24" square scalloped chipped edge glass with 3" frost. Available in all stock colors and fabrics.